The Beamers class is run every day alongside the High Fives. Starting at 4.15pm it is an hour of fun trying most pieces of equipment, but then to do everything is nearly impossible! 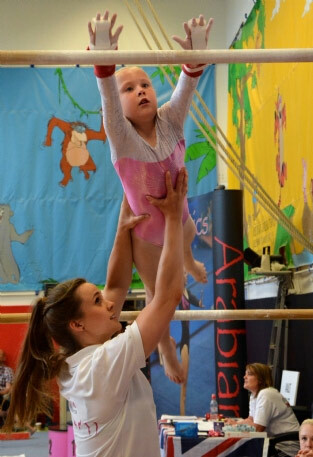 The club has A Bars, Balance beams, Climbing ropes, Vaulting table and vault set ups, a ten metre Fast track where upon they learn rebound like on a trampoline. They also have a 6 metre airbed to try things like round off and Cartwheels on as well as the full Olympic gymnastic sprung carpeted floor area. Like all classes they get the opportunity to do Certificates and badges as well as the very popular Arabian rosette scheme where each individual move is equalled with a colourful rosette which they may collect once earned. Rope climbing and Peg board climbing are two favorites for the kids to also try out. The lads that also do gymnastics with us also walk on the beam, leap, jump and forward roll as its all part of co-ordination and understanding your balance point. The coaching staff is a mixture of ex high level gymnasts who have turned their hands to coaching the sport they love to newcomers and also the more seasoned coach with a wealth of experience. Do not under estimate younger looking coaches as most have a wealth of recent skills, and some are present champions who have competed abroad! So if it’s an hour of gymnastics experience you want your child to have with good structure of coaching and the possibility of at least one competition a year then Beamers is the class for your child. Once a gymnast reaches the maximum age for this class, similar to a school, they will move up to the next age group/class. Arabian has a viewing window that you are welcome to watch your child from. For this class, the blind is up for the last 15mins of the session.